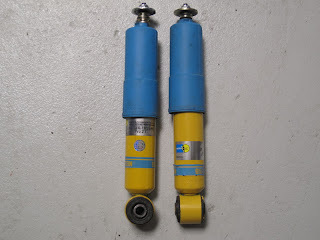 Nothing like a fresh set of premium Bilstein HDs to drastically improve the ride quality and performance of a VW Eurovan. After 8 years of suspending the heavy half of 4500 lbs of German schteel, Klaus' front dampers were getting soft. The van's front end would dive when braking and various clunking noises emanated from the front suspension when going over even the smallest sections of broken pavement. Picked this slightly used pair up on VWVortex for a whopping $60 (vs. $250 or so new) and had them installed today. Much better-controlled movements. Should have been done months ago.